Whereas in most novels a basically happy character is acted upon or takes action in such a way as to threaten their happiness, in Kelman’s early novels a basically unhappy character frets about their unhappiness while nothing changes: there is no inner decisiveness or fortuitous outer circumstance to alter their life. Often Kelman teases us with plot devices from conventional fiction which come to nothing. Two of these are used in A Disaffection: Doyle’s announcement that his is going to quit his job and his attraction to fellow teacher, Alison. Doyle’s exclamation in the staffroom – “That’s how I’m bloody leaving” – is more a cry of despair than a decision to direct his life in a new direction. These sentiments appear as early as page 15 but, at the novel’s conclusion over 300 pages later, he is still a teacher. The only change which might actually occur is a transfer to another school which he cannot remember requesting. The pipes encapsulate Doyle’s desire for expression – with a link to his working class background which he worries about having abandoned and an ironic nod towards the Pied Piper. Needless to say, his hopes they will somehow articulate his feelings – for example, towards Alison – are unfounded. They cannot counter-act Goya’s late, dark paintings which also fascinate him and best encapsulate the mood of the novel. This, then, is not a book to make you feel good about life – but it is also not at all cynical. 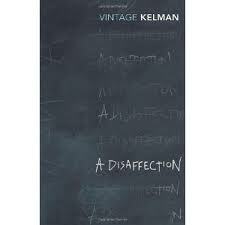 Kelman is a writer who never shows contempt for his characters, a vital ingredient of cynicism. If anything, Doyle cares too much, made inarticulate by the rawness of his rage against the cynical world he lives in. 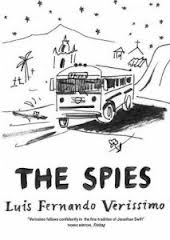 If you’re looking for a light-hearted, cool-headed summer’s afternoon of reading you could do a lot worse than pick up Luis Fernando Verissimo’s The Spies. A quick glance at Verissimo’s biography provides numerous hints that he will be an entertaining companion: as well as writing the occasional novel, he has filled his time with numerous newspaper columns and short stories, comic strips, and even a career as a saxophonist. The Spies may sound portentous but is, instead, an absurd tale of publishing, football and, above all, misunderstanding. Unfortunately, the narrator goes on to create his own shadows, building a ’true’ story around the story of the manuscript, believing that its author, Ariadne, is writing from life and in need of rescue. As further chapters of the story arrive, he becomes convinced that her husband has murdered her ‘Secret Lover’ and now holds her a virtual prisoner in her own home. So begins Operation Theseus, with the narrator recruiting a barful of friends to navigate a maze that is largely of his own creation. One by one the characters make their way to the small town where Ariadne lives, each with their own absurd cover story. It is these very attempts at disguise that will ultimately put them in danger, though not for the reasons they expect. All the elements of a classic murder mystery are in place: the family business, the missing brother, the drunk with a secret, the controlling husband and the mysterious beauty. This isn’t an episode of Inspector Morse, however, and each step in the story takes at least one character further from the truth. One character does end up dead but the ‘detectives’ do not so much uncover the murderer as create him. By the novel’s conclusion we are entertained, amused, and thoroughly warned us not to read too much into what we read. And never to trust a woman who dots her ‘i’ with a flower. Where Robin Jenkins left Tom Curdie’s redemption ambiguous throughout much of The Changeling, George Friel takes a much bleaker view in Mr Alfred M.A. Friel, too, worked as teacher in Glasgow while he wrote, publishing five novels between 1959 and 1974 (he died in 1975; his first novel, The Bank of Time, appeared when he was almost fifty). Mr Alfred M.A. is generally thought to be his best novel: it made The List’s list (trying saying that in a hurry) of the 100 Best Scottish Books of all Time; in his introduction to the 1987 Canongate edition Douglas Gifford describes it as “one of the greatest of Scottish novels”. The novel tells the story of an ageing school teacher on a downward trajectory. Mr Alfred (it seems only fair to give him his full title as this is how he is referred to throughout, an ironic sign of respect in a society without any) is given only the lowest of the boys’ classes to teach. Unmarried and seemingly friendless, he spends much of his spare time drinking. His descent begins when he strikes a particularly unpleasant boy, Gerald, who is unfortunately indulged by his mother (the novel opens with her chastising (physically, of course – this is the seventies) her younger daughter, Senga, for not making her brother’s tea). Provoked by Gerald’s insolence, he smacks him across the neck – “He knew at once he shouldn’t have done it.” Not because teachers are not allowed to strike children, simply because they must use a leather tawse or belt to do so. Mr Alfred is not a good man (but then Forbes desire to do good hardly ended well in The Changeling) but neither is he a bad man. A teacher that cannot teach, a poet that no longer writes poems, he is a man without dreams, only the anaesthetic of alcohol. 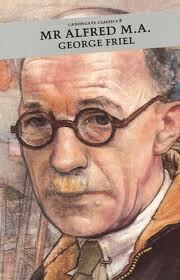 Friel uses him as an everyman, subjected to the disintegration of society. All stories in the novel end unhappily, including a Romeo and Juliet style sub-plot involving Rose’s sister. Mr Alfred M.A. is a novel infused with nihilism. There is a strong tradition in Scottish literature of education as an escape route form poverty. If The Changeling questioned this, Mr Alfred M.A. says clearly: there is no escape. You are currently browsing the 1streading's Blog blog archives for June, 2013.